MightyBooBoo describes the system in detail. He was able to buy many of the components through Craig's List, and the full system cost him less than $1000 -- about $3 per watt! Two 10 amp charge controller and fuse blocks. 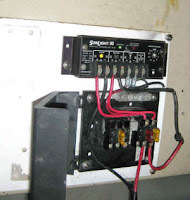 An inverter will be added to the system when 120 VAC "house" power is needed. 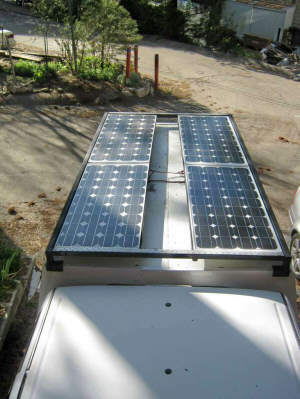 The picture shows the four 80 watt PV panels mounted on the existing truck rack. Some new angle iron was added to the rack to support the edges of the panels. 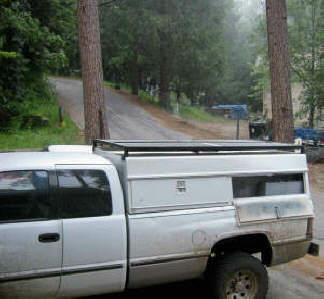 The truck has been driven some 2K miles over rough roads and at speeds up to 70 mph with the panels mounted as shown -- no problems. The picture shows one of the two MorningStar charge controllers and the fuse block. The system is set up as two independent systems -- each has two 80 watt PV panels, one charge controller, and two 12 volt batteries. Thanks to Boo for sending this in!